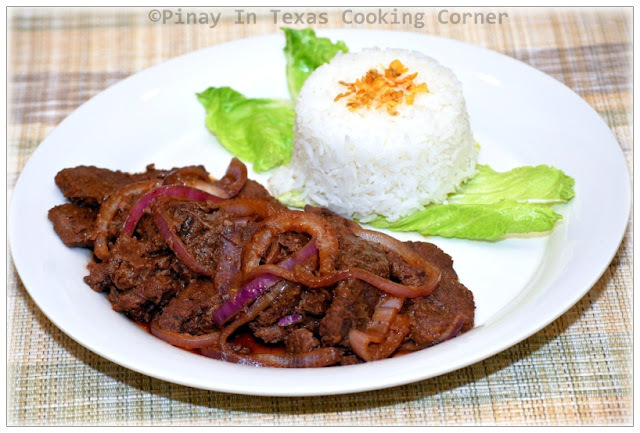 Bistek Tagalog or Filipino Beefsteak is a very delicious beef recipe that is so easy to prepare and doesn’t require much ingredients. 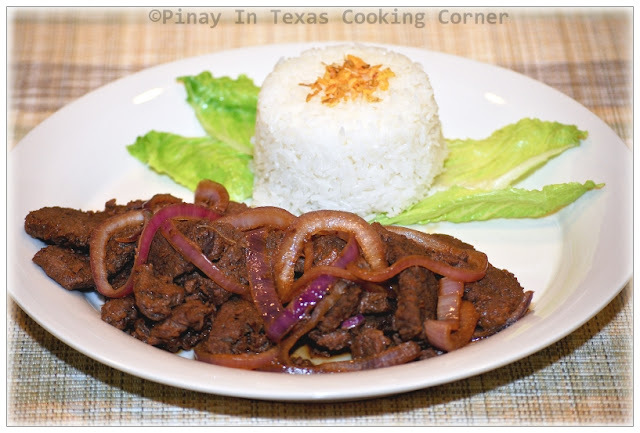 Basically, you can cook this with just beef, soy sauce, kalamansi(a small citrus fruit that is very popular in the Philippines) and onions. But to enhance the taste, I add pineapple juice to the marinade, and because kalamansi is not so common here in Texas, I use lemon instead. For this recipe, you can use any of the following beef cuts: chuck, flank, skirt or sirloin steaks. Most of the time, I use beef chuck. 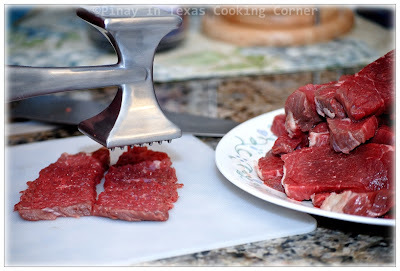 As long as you tenderize your beef well enough, the type of cut won't really matter. You should really try this simple yet great tasting recipe! You won’t regret it! 1. 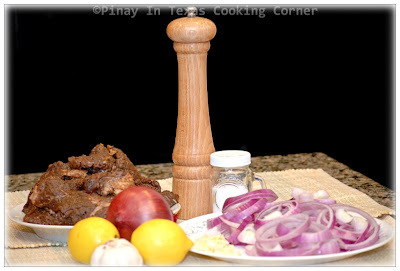 In a bowl, marinate tenderized beef in lemon, soy sauce, pineapple juice, black pepper and garlic. Cover the bowl with plastic wrap and let the mixture sit in the refrigerator for at least 2 hrs. 2. After marinating, drain the beef well. Reserve the marinade. 3. In a skillet over medium heat, sauté the garlic until golden brown. Add the beef and stir fry until the juice starts to come out. 4. Add the marinade. Reduce heat to medium low and simmer until beef is tender, stirring occasionally. Add salt & pepper to suit your taste. Add the onion rings and simmer until the onions are soft and caramelized. 5. Remove from heat. Serve with hot rice! This looks great and I am actually going to be trying it out for some clinets this week. I am linking to this post from my blog.